The Gefen EXT-HDMI-148 is a 1:8 HDMI Distribution Amplifier which allows you to send one source of digital high definition video to multiple displays at the same time. It supports all HDMI equipment, such as DVD players and satellite set top boxes and all HDMI displays. HDMI (High-Definition Multimedia Interface) is a digital point to point interface for audio and video signals. In operation, the digital video source is connected to the distribution amplifier on one side. On the other side, eight HDMI outputs are available to be used in part or in full. Once the unit is connected and powered, your source is routed to up to eight digital displays at the same time. This HDMI product supports BOTH Audio and Video signals. For home theater applications, this distribution amplifier is HDCP (high bandwidth digital content protection) compliant, making it effective for use with all HDMI displays. HDCP is a standard "key" encoded into the HDMI signal to prevent video data from being pirated. HDCP was strongly endorsed by the entertainment industry. If a source device is HDCP coded and is connected to a HDMI display or projector via HDMI without the proper HDCP decoding mechanism, the picture is relegated to "snow" or in some cases, a very low (480P) resolution. 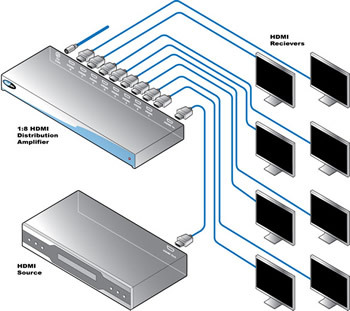 In order to see protected content, the source, the display and any device in between must be equipped with HDMI connections that can enable HDCP using "software key" decoding. Connect your HDMI video source to the distribution amplifier's input using the supplied HDMI cable. Then connect up to eight HDMI displays to the unit's eight HDMI outputs. Once connected and powered, your source will be seen on all eight displays at the same time. Note: HDMI output 1 is the primary connection and is used for the main display. HDMI output 2 through 8 follow the main display. The HDMI displays attached to the 1:8 HDMI Distribution Amplifier MUST have the same native resolution in order to get a picture.